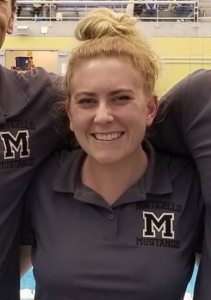 Monticello High School’s athletics department is pleased to announce the hiring of Jennifer Csapo as the Mustangs’ Head Swim & Dive Coach. Csapo has spent the last three seasons as an assistant coach for the Mustangs under Greg Remaly, helping numerous students qualify for regional and state championship events, including last season, when the Monticello girls swim team finished second in Region 3C and sixth in the VHSL Class 3 state swim meet. In addition to her years of experience as a Mustangs assistant, Coach Csapo spent four years as a Head Coach in the Jefferson Swim League with the Elks Lodge. A graduate of James Madison University, Coach Csapo teaches Language Arts at Monticello High School. For more information on Monticello Swim & Dive, please contact Head Coach Jennifer Csapo at jcsapo@k12albemarle.org.